On September 6 the U.S. Naval Air Systems Command announced that it had taken delivery of a Gulfstream G550 modified for the missile range support role. To be designated NC-37B in service, the G550 was handed over on July 30 with Phase I airframe modifications completed by Gulfstream. Following its acceptance by the Commercial Modifications and Range Support (CMARS) Team of the Navy’s Tactical Airlift Program Office (PMA-207), the aircraft is to be delivered to Raytheon as government-furnished equipment for Phase II modifications, which comprises the procurement and integration of the specialized equipment required for the range support role. 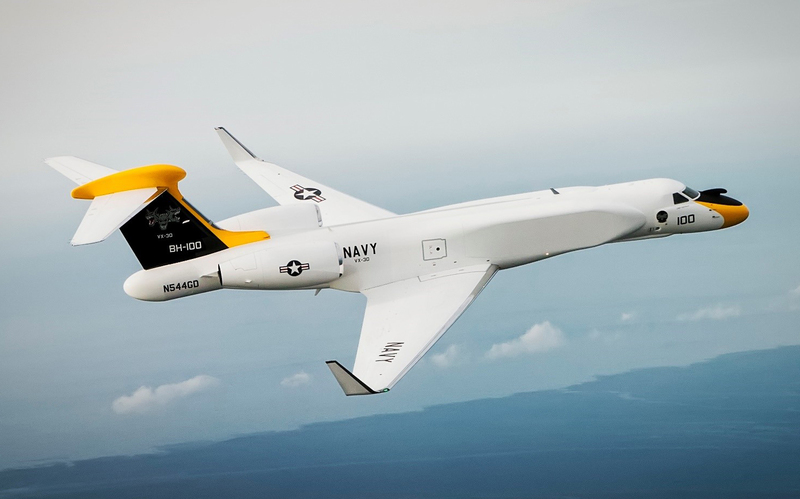 The aircraft is intended to replace one of the three NP-3D “Billboard” Orions operated by VX-30 “Bloodhounds” at the Naval Weapons Test Squadrons Point Mugu base on the Californian coast. Service entry is slated for 2021. The NC-37B is a further modification of the CAEW (conformal airborne early warning) version of the G550 developed by Gulfstream and IAI. Although no details of the systems have been released, it is likely that the NC-37B will house telemetry antennas in the fuselage side fairings for the detailed tracking and analysis of missile tests, while a nose-mounted search radar—most likely the Telephonics APS-143—will be employed to ensure that test ranges are clear of any accidental intruding vessels or aircraft. The APS-143 is used in the U.S. Air Force’s E-9A range support aircraft that operate from Tyndall AFB, Florida. At least one of the current “Billboard” Orions is outfitted with the Cast Glance optical still camera system for detailed photography of tests, including those conducted in near-space. It is possible that this capability will be replicated in some form in the NC-37B. The aircraft is also likely to have extensive communications capability, including relay functions and a satcom antenna in the fin-tip fairing. The aircraft has considerable extra capacity to accommodate the integration of new systems. Gulfstream is experiencing something of a resurgence in its special-missions department. The CAEW configuration currently serves with Israel (named Eitam), Italy (E-550A) and Singapore, and is being suggested as a candidate for the Royal Air Force. Another configuration, also developed in conjunction with IAI, is more suitable for signals intelligence (Sigint) gathering, and examples serve with the Israel Air and Space Force (named Shavit). Australia has ordered two Sigint G550s via Foreign Military Sales, with L3 Communications performing the system integration. Meanwhile, under the “Cross Deck” program, BAE Systems and L3 Technologies have begun the task of transferring the Compass Call communications jamming system from the U.S. Air Force’s current EC-130H Hercules platform to the G550 business jet. Around 70 percent of the Compass Call suite is being transferred in its existing form, with the remainder comprising new or modified systems. An initial two EC-X (EC-37B) aircraft are due to enter service in 2023, with a total of 10 planned.